Power pills are situated in each corner of the rectangular maze and eating one of these makes Pac-Man temporarily invincible; the four ghosts also change to dark blue in color and can now be eaten by Pac-Man. But watch out…a flashing blue ghost indicates that the power pill is about to wear off and the ghosts are about to transform back to their former selves again. Once Pac-Man eats a blue ghost, this ‘skinned’ ghost then becomes visible as a pair of eyes only, will return to the ghost pen in the middle of the maze, regenerate into its former self, and return to the maze to continue its pursuit of Pac-Man. Each maze contains 240 dots and 4 power pills, and all must be eaten to complete the level; whereupon the entire sequence begins again with an increased level of difficulty (the action increases in speed and power pills decrease in effectiveness). Twice in every level, a bonus fruit or prize item will temporarily appear in the middle of the maze below the ghost pen. Pac-Man can eat these bonus items to receive extra points. Also, there is an escape tunnel on each side of the maze that Pac-Man can use to escape any ghosts that are currently closing in on him. The ghosts can also use the tunnel, but take longer to pass through it than Pac-Man, making escape a little easier. 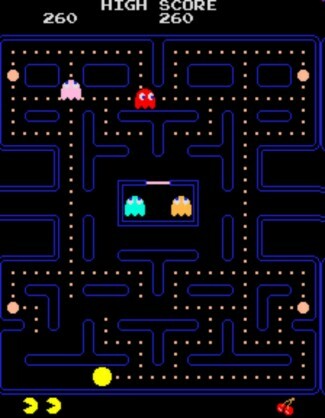 1) Blinky, the red ghost, chases Pac-Man across the screen and off the side. Then he re-appears running in the opposite direction, having turned blue, followed by a giant Pac-Man! This intermission is played after Round 2. 2) Blinky is again chasing Pac-Man, but this time he rips his red sheet on a nail on the ground, and we can see his pink body under the sheet! This intermission is played after Round 5. 3) Blinky chases Pac-Man across the screen once more, this time with his sheet sewn. They disappear at the left side and then Blinky reappears coming back the opposite direction. This time he is bare and drags his sheet behind him. This intermission is played after Round 9, 13 and 17. No intermission is present between rounds after the 18th one. The original Namco Puckman Upright model came in a white cabinet that may look familiar to most gamers. This cabinet is the same ‘swoopy’ design used for “Pac-Man” and “Galaxian”. The only actual design difference was the coin door. The Japanese version had a tall coin door with a single coin mech, while the U.S. version, “Pac-Man”, had a fat coin door with two coin mechs installed. However, the graphics on the Japanese machine were completely different from those of the U.S. machine. The marquee had the ‘Puckman’ logo off to the right-hand side at an angle, and showed a scene with half a dozen cartoon Puckmen eating power pellets, with a few ghosts lingering off to the side. The monitor bezel was largely red and was of a circular design and had many Puckmen lounging around the perimeter of the circle. The control panel continued the reddish graphics and had instructions in Japanese, along with a yellow ball-top 4-Way joystick and Start buttons for each player. The sideart was a large circular sticker that advertised the game’s name, and had many cartoon Puckmen in action around the edges of the circle, with the word Namco displayed prominently at the bottom. The cabinet was finished off with yellow t-molding on the edges. A final bootleg/hack upright model was a complete fake, but there were a lot of them. They seemed to use converted Namco cabinets, painted white, and were decorated with very strange looking sideart that showed Puckmen and ghosts that looked nothing like the ones on any other Puckman/Pac-Man products (since when has Puckman had green frogs legs?). The marquee had an odd Puckman logo in yellow and orange, along with a picture of the blue ghost and the strange ‘frog legged’ Puckman. The game was originally known in Japan as Puckman, but due to the West’s predilection with changing words to vulgarities by scratching part of the word off (in this case, changing the word ‘Puck’ to something rather less socially acceptable by scratching off part of the letter ‘P’), the name was changed to “Pac-Man” for its release to the U.S. arcade market in October 1980. The name ‘Pac-Man’ comes from the Japanese slang term ‘paku-paku’, which describes the motion of the mouth opening and closing during eating and translates to English as ‘to eat’.